(Photo: Peter Kenny / Ecumenical News)Staffan de Mistura, United Nations Special Envoy for Syria, in Geneva, Switzerland on Oct. 12, 2015. Pope Francis has shared lunch with 21 Syrian refugees at his residence in the Vatican's Casa Santa Marta, exchanging gifts, toys and drawings with the children whose homeland stays mired in an intractable conflict. The Syrian families were those brought by the Pope after his day-trip to Lesbos, Greece in April, Vatican Radio reports as the conflict the conflict in Syria is intensifying to the deep concern of U.N. officials trying to facilitate an end to it. Pope Francis brought the first group back to Rome with him on his flight April 16, and the second group arrived to Rome in mid-June. During the Aug. 11 meal, "both adults and children had an opportunity to speak with Pope Francis about the beginning of their lives in Italy," the Vatican said. The Pope presented the children with toys and gifts and the children gathered around the Pope to give him a collection of their drawings. As rebel factions continue fighting Syria's government of Bashar al-Assad for control of Aleppo, Christians in the country's second largest city prayed and fasted for peace. "We don't know what's going to happen. We announced to all the priests , since yesterday, and we've also told the people, that we want to fast and pray the next 72 hours so that the will for peace always prevails and so that it wins over the will for war," Father Ibrahim, a pastor in Aleppo, told Vatican Radio Aug. 9. Rebels in the city claim to have broken government siege of Aleppo, where some 250,000 people live in rebel-held areas. Air strikes on rebel positions in the city have intensified in recent days, Catholic News Agency reported. "Next week frankly is going to be crucial on that. Regarding what we sadly start looking at as the 'battle for Aleppo,' it is currently proving one thing once again, and I did refer to that when I spoke to the Security Council two days ago, no military sustainable solution is possible in Aleppo or nowhere else in Syria. 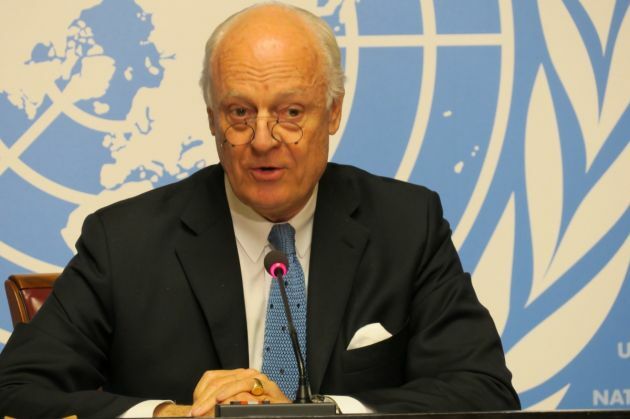 De Mistura said, "It seems that this is sometimes forgotten, but what has happened and what has been happening in Aleppo the last few days, with attacks and counter-attacks is once again proving it. "Secondly, that in all of this, again, civilians on both sides of the conflict, on both sides of Aleppo, are in danger, of being surrounded and affected by shortages and bombings."